Update everyone in your Slack workspace about what happened during the meeting, what decisions were made and what tasks were assigned. Start by inviting the MeetNotes bot to the preferred slack channel. 2. You can share notes in both private and public channels. If you have chosen public, a drop down lists channels where MeetNotes bot is added. 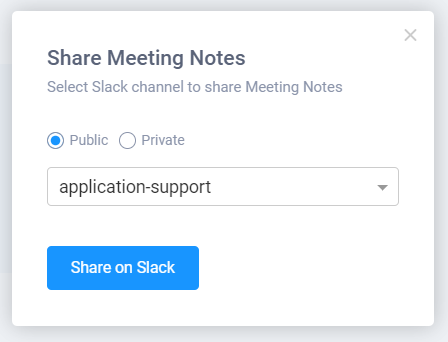 Select the channel where you want to share notes and click on "Share on Slack" button. If you choose to share in a private channel, type in the name and hit the "Share on Slack" button. Notes are now shared as a Slack Post. No more truncated notes and no more switching between different windows.